Protecting the Natural Basis for life while Improving the Quality of Life. Sto is a leading supplier of exterior facade insulation systems and manufacturer of high-quality exterior & interior render cladding systems and coatings worldwide. As the authorised partner of Sto for Australasia, we are committed to the Sto philosophy. "Building with conscience". Having developed a full range of render systems, and that have been tested and certified by BRANZ for New Zealand construction industries, Sto is recognised as an industry leader in exterior and interior render facade, cladding, repairs, and restoration markets. People and Architecture, Sto provides the link. Architecture plays an important role in our lives. It lends urban and rural landscapes character, and should ideally be embedded in an intact environment. For us, "Building with conscience" means enhancing functionality and aesthetics on a sustainable basis and creating an environment in which people feel at one with their surroundings. Apart from researching, developing and marketing Sto products, systems and services, we also attach great importance to optimising the value added process for trades people, architects and building owners alike. The past is our link to the future; As the potential of a tree hinges on a seed and good ground, the strength and sustainability of a company relies on the calibre of its management, ability of its staff and economic circumstances for sustained growth. The Sto Group an international company with its head office in Weizen, Germany can trace its origins back to a lime and cement works established in 1835. After acquiring the company in 1936 it is the Stotmeister family’s development of cement free organically bound renders in 1955 and StoTherm Classic insulation system in 1960s that has sustained Sto’s success. Today Sto remains committed to those primary objectives of delivering products for sustainable, environmentally-friendly construction. Today, Sto offer a full range of paints, plasters, renders and insulation systems for both interior and exterior use. With other subsidiaries producing StoVentec exterior insulated facade rain screen’s and StoSilent acoustic interior panelling the range of innovative products just keeps growing. Stoanz Limited originated as a plaster and protective coatings company, founded in 1994 by Peter and Svend Andersen. By the late nineties they had built the company to become a successful residential render business, but they were frustrated by the lack of quality materials in the NZ market. In 1999 Svend successfully secured the Australasian distribution rights for all Sto products after a trip to Germany, transforming the business and beginning the current long standing partnership. Protecting the natural basis for life and improving quality of life are important aims in social policy. Sto actively pursues these aims, always acting in accordance with the company's guiding principle: "Building with conscience". In order to define and implement its ecological targets, Sto has developed a system of environmental management conforming to international standards. This relates to the entire process chain – from the procurement of the raw product, to production, packaging and logistics. 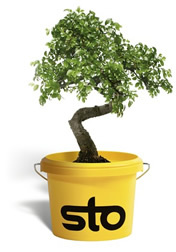 Sto products make a clear contribution towards improving the quality of the environment. Sto external wall insulation systems and insulated cladding systems reduce heating requirements and CO2 levels within buildings. These systems represent the contribution Sto is making towards active environmental protection through reducing air pollution and improving the global climate. From the bark of a dog to the electronic flash of an e-mail. The interpretation and implementation of messages provides contact with others in our world. Today with a prolific amount of documentation, time restraints and penalties, professionals, clients and contractors rely on the ability of a company to provide service to successfully complete projects on time. Every Bucket of Sto involves a complex chain of communication and management procedures involving data processing and mechanized manipulation undertaken through a managed ecological process to deliver Sto product world wide under the company's policy of "Building with Conscience".